The biggest hotel event of the year is taking place on the 16th March 2016, located in Athens and made of the best ingredients, that is the best hotel bars on the planet. Its cocktail will be irresistibly tasty but available for a single day only. Welcome to The Clumsies Hotel Bar! The Clumsies Hotel Bar opens its gates in the center of Athens right next to The Clumsies and is going to be housed in an impressive 100-year-old 2storey mansion. 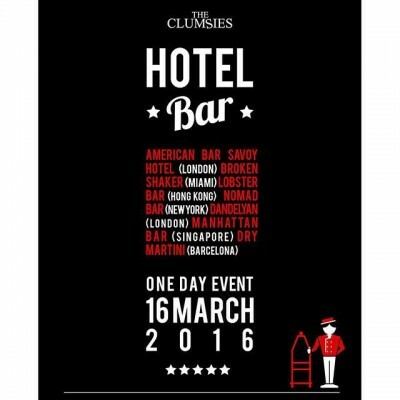 The Clumsies’ team, restless as always, scrutinizes hotel bars and sets up a model hotel bar. On the ground floor, the reception bar “The Clumsies”, welcomes its visitors and confirms their reservation, while in each room on the 2 floors, the best hotel bars worldwide, which were chosen and included in The World’s 50 Best Bars list for the year 2015, will be housed. Particularly, the emblematic Savoy American bar (London), Broken shaker (Miami), Lobster bar (Hong Kong), Nomad (New York), Dandelyan (London), Manhattan bar (Singapore), Dry Martini (Spain), each one of which initiates us to its world and philosophy according to their concept. In the Clumsies Hotel Bar there are no requirements for reservation. Our ‘hotel’ guests can be guided in every single room, meet seven charming destinations in one place, share emotions, train and eventually live through a lifetime experience.